I am writing to you again from Rome, and today we are celebrating the memorial of St. Pope John Paul II, on the 40th anniversary of his election as pope. And as we enter the final week of the Synod of Bishops on young people, it is good to remember that he is the one who started World Youth Day and he raised up many young people as saints. In fact, at the Cathedral of Our Lady of the Angels, we have opened a new chapel to one young saint that he beatified, St. José Sánchez del Río, a 14-year-old martyred for his faith during the persecutions in Mexico in the 1920s. 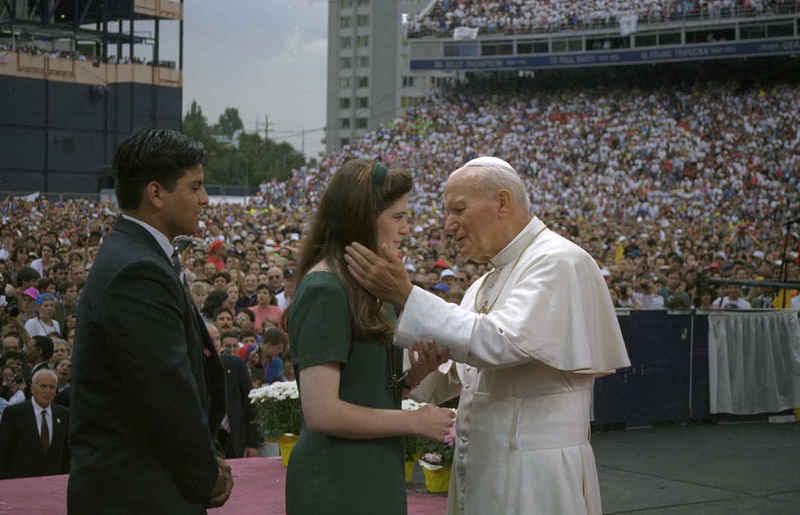 St. John Paul called young people to greatness, he challenged them to give their lives to Jesus Christ and to share in his mission. “Do not be afraid to be saints!” he would say. The synod is urging all of us in the Church to make a renewed commitment to walking with our young people. “Accompaniment” has been one of the watchwords of this synod. And as we walk together, we need to always keep in mind that our journey has a destination. We are on our way to God our Father, who is the source of love and the reason and meaning of our lives. Always, when we accompany young people in the Church, we are walking with Jesus Christ — following him with love, living according to his words, teachings, and example. In fact, we can only reach our destination by following the path that he shows us. If we are not walking together according to his way, we are only walking in circles. Accompanying young people means calling them to conversion as Jesus did, calling them to open their hearts and change their lives so they can know the love of God and his plan for their happiness. This is the beautiful truth that the Church is called to proclaim to the world — and to proclaim in a special way in this moment to our young people. I wonder sometimes if we have lost some of our confidence in this truth. The sorrows in the world, the scandals, the overwhelming materialism and consumerism in our technological society. All of this tends to close our eyes to God’s presence, to any sense that there is a transcendent dimension to reality. In many practical ways, we live in a world where God does not matter anymore. And it becomes harder to believe that there is more to reality than what we can see and experience with our senses. It becomes harder to believe that there are permanent truths, beyond what we can discover with our science and technology. I have been reflecting on this a lot during this synod. We have the truth and the world is waiting for our witness. But we cannot share what we are not living. In this moment in the Church, I really believe that all of us need to make a new act of love for Jesus. We need to pray for deeper faith, for new hope in the power of his cross and resurrection. We need to believe that Jesus alone holds the words of life — that in his teaching we will find the happiness that God wants for us in this world and a love that never ends in the world to come. This is what young people are looking for from the Church — leaders they can trust to tell them the truth about life. “Listening” has been another watchword of the synod. Throughout this synod, in the hall with the bishops every day, there have been young people — speaking to us about their lives, challenging us with their questions. These young people want to know the truth. The real truth. Not our personal ideas or preferences. They do not want to be told what we think they want to hear. Young people want to know what answer Jesus gives. This is what John Paul told them. He was not afraid to talk tough to young people. He called them to greatness, but he wanted them to be realists, too.The way of Jesus can lead us to the cross, but there is no other way to find truth and life, he said. Strong words, but they are true. And they remind us why the truth is so essential in our mission young people. Pray for me in this week and I will be praying for you here in the Eternal City. And keep praying for Pope Francis and my brother bishops and I here at the synod. And let us ask our Blessed Mother Mary to pray for the Church, that we might call all young people to have the courage to be saints. LA MISIóN DE LA EDUCACIóN CATóLICA — ¡HACER SANTOS!